Technical Car Experts Answers everything you need: Mazda 1995 B2300 will not start when hot? 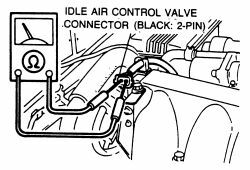 The Idle Air Control (IAC) valve controls the engine idle speed and dashpot functions. The valve is located on the side of the throttle body. This valve allows air, determined by the Power train control module (PCM) and controlled by a duty cycle signal, to bypass the throttle plate in order to maintain the proper idle speed. Disengage the wiring harness connector from the IAC valve . Using an ohmmeter, measure the resistance between the terminals of the valve. Due to the diode in the solenoid, place the ohmmeter positive lead on the VPWR terminal and the negative lead on the ISC terminal. If the resistance is not 7-13 ohms, replace the IAC valve. The Idle Air Control (IAC) valve is an integral component of the Bypass Air Control (BAC) valve. The resistance should measure 10.7-12.3 ohms at 68° F (20° C) for 3.0L equipped models and 7.7-9.3 ohms at 73° F (23° C) for 2.6L engine equipped models. If the resistance does not measure within specifications, replace the BAC valve. 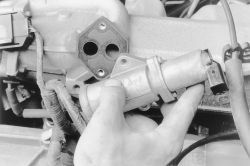 Disengage the wiring harness connector from the IAC valve. Remove the two retaining screws, then remove the IAC valve and discard the old gasket. Clean the IAC valve mounting surface on the throttle body of old gasket material. Using a new gasket, position the IAC valve on the throttle body. Install and tighten the retaining screws to 71-106 inch lbs. (8-12 Nm). Attach the wiring harness connector to the IAC valve. 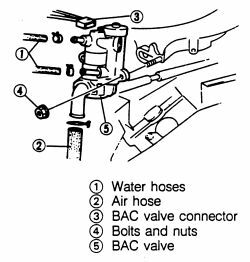 Disconnect the water hoses (if equipped) and air hose from the BAC/IAC valve. 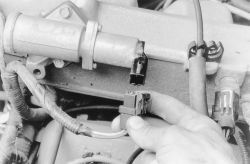 Disengage the wiring harness connector from the BAC/IAC valve. Remove the mounting fasteners from the valve assembly. 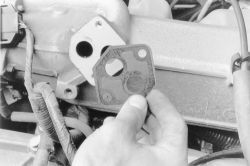 Remove the BAC/IAC valve assembly, along with the mounting gasket and O-ring from the vehicle. Remove any foreign material from the contact surface. Install the BAC/IAC valve assembly, with a new mounting gasket and O-ring, onto the engine in correct position. Install and tighten the mounting fasteners to 14-18 ft. lbs. (19-25 Nm) on 3.0L engines, and 22-30 inch lbs. (2.5-3.4 Nm) on 2.6L engines. Plug in the valve wiring harness connector. 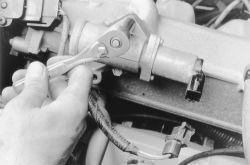 Connect the air hose and water hoses (if equipped) to the valve assembly. If equipped with water hoses, verify that the valve assembly does not leak. Labels: Mazda 1995 B2300 will not start when hot.